Ok, this last article from Muth, as promised. After this, I’ll just include bits and pieces from his daily roundup. Again, this impressed me, coming from our daily liberal rag and it provides a brief glimpse of hope for this town actually getting some truth. Good for Chuck, bucking the trend. 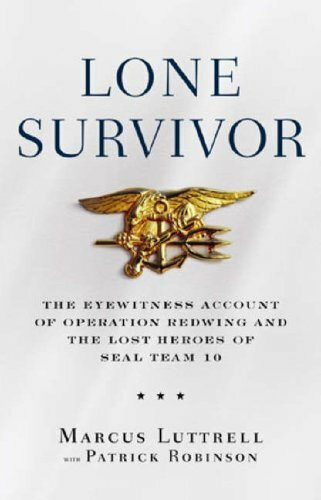 For this Veterans Day weekend I decided to read “Lone Survivor: The Eyewitness Account of Operation Redwing and the Lost Heroes of SEAL Team 10.” The story is about four U.S. Navy SEALs whose June 2005 mission in northern Afghanistan “was to capture or kill a notorious al Qaeda leader known to be ensconced in a Taliban stronghold surrounded by a small but heavily armed force. Less than 24 hours later, only one of those Navy SEALs remained alive,” Marcus Luttrell. “Looking back, during our long journey in the C-130 to Afghanistan, I was more acutely aware of a growing program which faces U.S. forces on active duty in theaters of war all over the world. For me, it began in Iraq, the first murmurings from the liberal part of the U.S.A. that we were somehow in the wrong; brutal killers, bullying other countries; that we who put our lives on the line for our nation at the behest of our government should somehow be charged with murder for shooting our enemy. “It’s been an insidious progression, the criticisms of the U.S. Armed Forces from politicians and from the liberal media, which knows nothing of combat, nothing of our training, and nothing of the mortal dangers we face out there on the front line. Each of the six of us in that aircraft en route to Afghanistan had constantly in the back of our minds the ever-intrusive rules of engagement. “These are drawn up for us to follow by some politician sitting in some distant committee room in Washington, D.C. And that’s a very long way from the battlefield where a sniper’s bullet can blast your head, where the slightest mistake can cost your life, where you need to kill your enemy before he kills you. “And those ROE are very specific: we may not open fire until we are fired upon or have positively identified our enemy and have proof of his intentions. Now, that’s all very gallant. But how about.when a bunch of guys wearing colored towels around their heads and brandishing AK-47s come charging over the horizon straight toward you? Do you wait for them to start killing your team, or do you mow the bastards down before they get a chance to do so? “That situation might look simple in Washington, where the human rights of terrorists are often given high priority. And I am certain liberal politicians would defend their position to the death. Because everybody knows liberals have never been wrong about anything. You can ask them. Anytime. “However, from the standpoint of the U.S. soldier, Ranger, SEAL, Green Beret, or whatever, those ROE represent a very serious conundrum. We understand we must obey them because they happen to come under the laws of the country we are sworn to serve. But they represent a danger to us; they undermine our confidence on the battlefield in the fight against world terror. Worse yet, they make us concerned, disheartened, and sometimes hesitant. “I can say from first-hand experience that those rules of engagement cost the lives of three of the finest U.S. Navy SEALs who have ever served. I’m not saying that given the serious situation, those elite American warriors might not have died a little later; but they would not have died right then, and in my view would almost certainly have been alive today. “I am hopeful that one day soon, the U.S. government will learn that we can be trusted. We know about bad guys, what they do, and, often, who they are. The politicians have chosen to send us into battle, and that’s our trade. We do what’s necessary. And in my view, once those politicians have elected to send us out to do what 99.9 percent of the country would be terrified to undertake, they should get the hell out of the way and stay there. “I realize I am not being specific, and I have no intention of being so. But these broad brushstrokes are designed to show that the rules of engagement are a clear and present danger, frightening young soldiers, who have been placed in harm’s way by their government, into believing they may be charged with murder if they defend themselves too vigorously. . . . I simply do not want to see some of the best young men in the country hesitating to join the elite branches of the U.S. Armed Services because they’re afraid they might be accused of war crimes by their own side, just for attacking the enemy. “And I know one thing for certain. If I ever rounded a mountainside in Afghanistan and came face to face with Osama bin Laden, the man who masterminded the vicious, unprovoked attack on my country, killing 2,572 innocent American civilians in New York on 9/11, I’d shoot him dead, in cold blood. At which point, urged on by an outraged American media, the military would probably incarcerate me UNDER the jail, never mind IN it. And then I’d be charged with murder. This Veterans Day, let’s commit to doing more than just slapping an “I Support the Troops” bumper sticker on our car or tying a yellow ribbon ’round the old oak tree. Let’s commit to fighting to give men like Marcus Luttrell the freedom, authority and confidence they need to do the job they’ve been trained to do and we’ve asked them to do. Supporting the troops doesn’t mean bringing them home while the threat to our nation and our citizens still exists. It means letting them win. It means letting them kick (expletive) and take names. It means pinning a medal on their chest for killing a bad guy, not pinning a murder rap on them. And it means extending a heartfelt “Thank You!” to each and every veteran you come across this Veterans Day. They’ve earned it. And then some. Chuck Muth-Tucson’s Op-Ed APPEARS To Be Pleasantly Conservative! I’m on my way to Washington, DC, for a few days to visit all of our tax dollars and stare in awe of everything great the Democrats are doing on our behalf. But first I have apologize for all the rotten things I’ve ever said about the Transportation Safety (or is it Security) Administration, aka, the TSA. Those are the folks who operate the security checkpoints at airports and create those agonizingly long lines to board a commercial flight. But I have to admit they caught me red-handed yesterday trying to smuggle a can of deadly Arid Extra Dry onto my plane. Doesn’t everyone feel a lot safer now? “The choices for America have never been clearer. On almost every issue, Democrats and the left are promoting more government ownership and control, pushing America closer to a welfare state. All of the Democratic Presidential hopefuls are running on a decidedly collectivist and socialistic leaning platform. “The Democrats want socialized medicine and more federal control of our schools. They are committed to raising taxes and expanding federal government programs. They will increase the burden of regulations and taxes on the American people, cost American jobs, and reduce America’s competitiveness around the world. “Fresh from a Sunday interview during which he said he would support overturning Roe v. Wade but not a human life amendment, Fred Thompson defended his pro-life views. In New Hampshire, Thompson said he is adamantly pro-life even though he won’t go further than letting the states pass their own abortion laws. “A Colorado Springs elementary school is one of the latest to ban tag on its playground. Running will still be allowed as long as there is no chasing. . . . Other schools have already banned swings, merry-go-rounds, teeter-totters, crawl tubes, sandboxes and even hugs. I’m beginning to think there may be hope for the conservatives marooned in this far left fringe town! Chuck even wrote a beautiful tribute to our Veterans–that deserves a post all its own. Look for more of Chuck Muth’s News and Views–I think I like this guy! Filed under: Chuck Muth, Miss Beth, Tucson Citizen |	Comments Off on Chuck Muth-Tucson’s Op-Ed APPEARS To Be Pleasantly Conservative!